The focus on employee engagement as a driver of better business results has gotten so much traction it’s spawned an entire category of solutions within the HCM universe. But if you’re a SumTotal client, you already own a tool that has incredible — but often-overlooked — potential for creating an environment in which engagement can not only flourish, but actually be sustained. It’s all about having content that strategically positions your company, is easy to find, and truly engages your employees to seek opportunities to make a difference and to grow professionally. 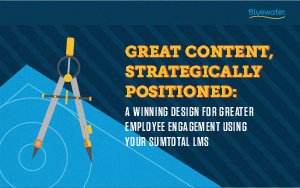 To really shape your SumTotal LMS into the effective piece of technology you know it can be — to see it achieve the results you and your leadership team expect it to deliver — you need to be a content architect and have a great content strategy. It’s all about being ridiculously happy with your SumTotal LMS.